12 To prepare onions for flavouring. L. Plamer Slice 6 or 8 large onions & fry hem with a lump of butter a nice brown put them into a stew pan with a little of a second stock. Let them stew perfectly soft - then cut thme through a Tammey- Then stir in a little cayenne pepper & salt & keep it in a basin for use. 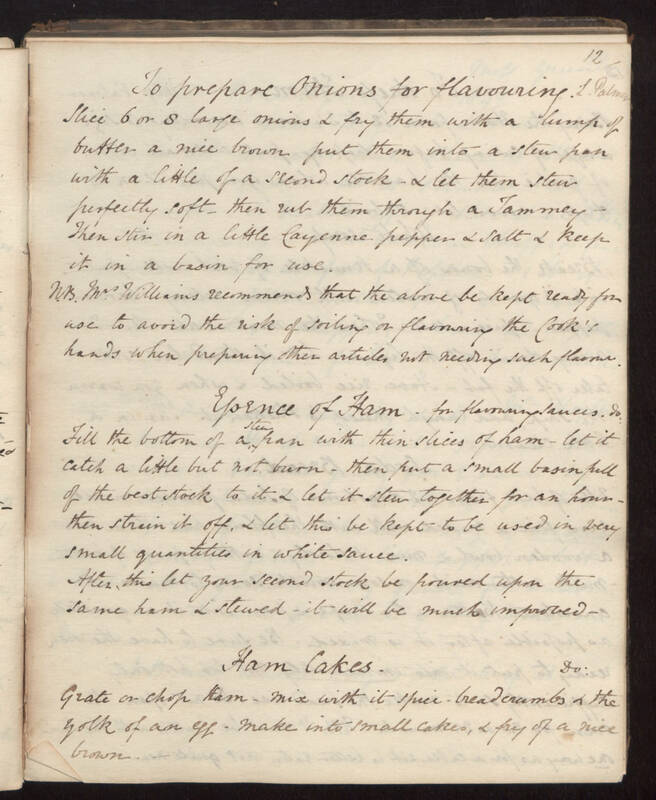 N. B. Mrs. Williams recommends that the above be kept ready for use to avoid the risk of soiling or flavouring the Cook's hands when preparing other articles not needing such flavor. Essence of Ham - for flavouring sauces. & Fill the bottom of a stew pan with thin slices of ham - let it catch a little but not burn - then put a small basin full of the best stock to it & let it stew together for an hour - hen strain it off. & let this be kept to be used in very small quantities in white sauce. After, this let your second stock be poured upon the same ham & stewed - it will be much improved Flam Cakes. Do: Grate a chop ham - mix with it spice - breadcrumbs & the yolk of an egg. Make into small cakes, & fry of a nice brown.